The Appalachian Trail has a rich and full history among trails. It is the longest hiking-only footpath in the world, ranging from Maine to Georgia. It crosses 14 states and runs 2,190 miles. It was the lightbulb idea of Benton MacKaye, a Massachusetts regional planner and forester of the United States Forest Service. His idea started as a continuous wilderness trail that he presented back in 1921, which was eventually completed in August of 1937. 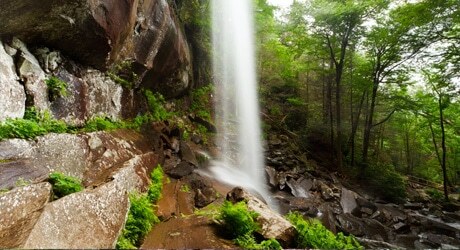 The Appalachian Trail is one of the most well-known trails in the country. Known as the A.T. to those who forge the path, it runs for more than 71 miles through Great Smoky Mountains National Park. Hikers follow the Appalachian Trail with the assistance of a system of “blazes” painted on trees, posts and rocks. It usually takes 7 days for most people to hike the Smoky Mountain section of the A.T. You can shorten your trek by using Newfound Gap or Clingmans Dome as a mid-point, both of which can be tackled in 3 to 4 days. Remember, these routes are all one-way trips, you will have to make arrangements for transportation at the end of your hike. For spectacular views and horizons make sure to take the Appalachian Trail via Clingmans Dome. There you will be treated to the highest point, not only on the Appalachian Trail, but in all of Tennessee at 6,643 feet. There you will also find restrooms and fresh water. There are 94 miles of the Appalachian Trail in Tennessee, but the Trail runs along the Tennessee/North Carolina border for an additional 160 miles. Keep in mind you’ll need an advance permit for the Great Smoky Mountains National Park, and depending on the length of your hike, shelter reservations as well. All backpackers are required to stay at designated sites. Trail management encompasses the on-the-ground stewardship performed by volunteers and agency partners to maintain the Trail. 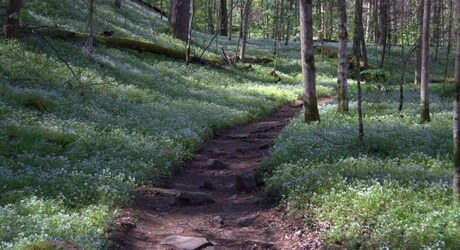 The Smokies portion of the Appalachian Trail is well maintained and safe for hikers. Some of the work performed includes cleaning and replacing water bars, rehabilitating steps and turnpikes, and improving trail tread. Raingear – Carry a rain jacket or poncho at all times in the Smokies. Rain pants should be included in colder weather. Water – Carry two quarts per person on longer hikes. Map – A variety of park trail maps are available. Keep one in your pack at all times. Food – Carry high energy snacks and eat often. Flashlight – A good flashlight or headlamp is welcome if you are caught out on the trail after dark. Matches – Waterproof matches are best. Whistle – Bring a whistle to signal rescuers if lost. All children should carry one.